Is your dog back in Black Bones? They should be! This is one of our most versatile necklaces to date. Elegant, bold, dress it up, dress it down, dress to impress or dress your best! The sleek shine that this design offers will blow you away. 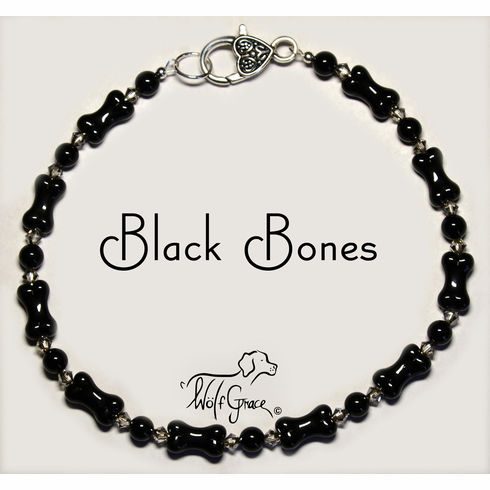 The 14.5x8mm 3-Dimensional Black Czech Glass Dog Bone beads enhance that special something that the stunning black Onyx brings to attention. Not only does black express boldness, confidence and class, but the design is contrasted by the 4mm bicone Crystal Satin Austrian Swarovski beads between each 6mm round Onyx and Dog Bones. Who says money can't buy happiness? Your dog will thank you for dressing up their wardrobe! To help keep the fashion game strong, the beads are strung on Sterling Silver jewelry-grade wire. Notice on each end of the necklace, how the Sterling Silver crimp covers reinforce and conceal the Sterling Silver crimps, which hold the beads securely in place.